WRENTHAM, Mass. – Prior to Friday morning’s game, Mike Vitelli took his son inside the building to look at some of the trophies that King Philip earned while he was coaching the Warriors from 2002-2007. It was a quick trip down “memory lane” before Vitelli led North Attleboro onto Macktaz Field to face his former team for the first time. The non-league meeting between the two teams would turn into an instant classic. 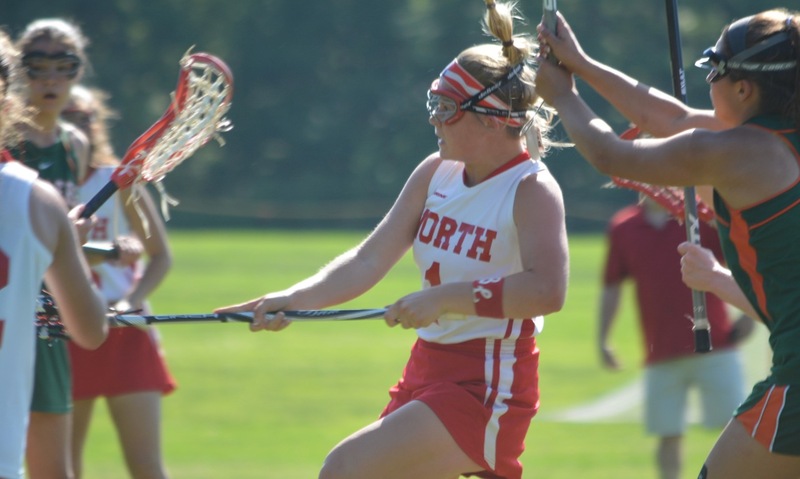 North battled back with three goals in the final 3:33 of regulation, including a goal by Erin Holley with 14 seconds on the clock, to force overtime. 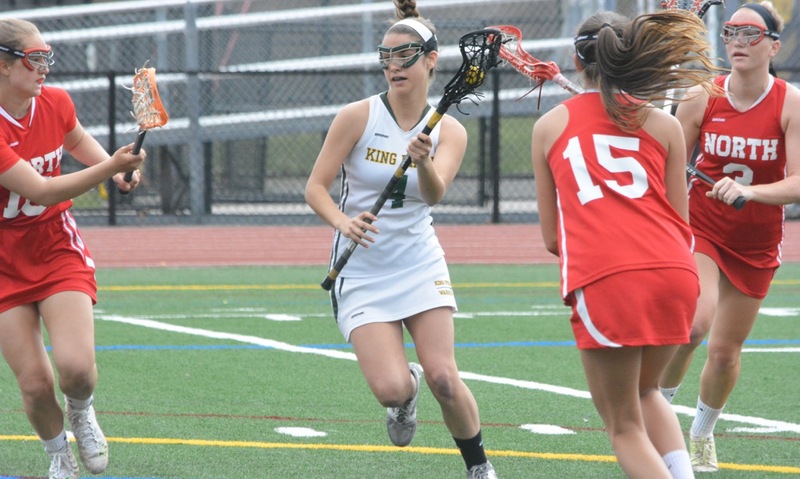 Amid controversy about North being denied the opportunity to take an eight-meter chance in the OT period, Jen Lacroix notched her fourth goal of the game to lift King Philip to a 13-12 victory. 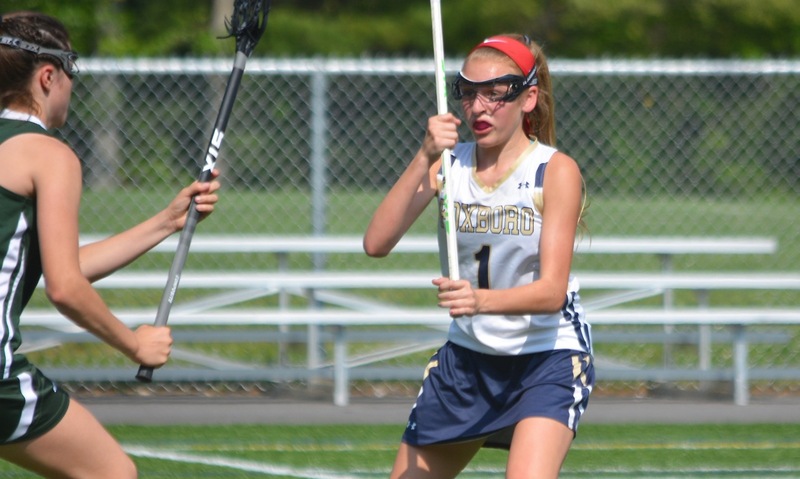 With 3:18 left in the sudden death overtime period, following a big save by North goalie Brooke Ebert (11 saves) to deny Angela Vellante from close range, North drew a free position chance. The clock continued to tick down while the eight-meter chance was being set up and when it hit 3:00 the horn sounded signifying the teams had to switch sides. The officials ruled that North would not be able to take its eight-meter chance and the game restarted with a draw control to the bewilderment of many in attendance (on both sides). North won the draw and sophomore Chloe Olsen had a good shot in transition, but it was denied by Caroline Watson (11 saves). KP would go on attack and the ball cycled around to Lacroix, who turned the corner and slung a shot just inside the post to win the game. North trailed 3-1 early in the game, but the Rocketeers would go on a 7-3 run to close out the half and led 8-6. Hana Caster scored a first half hat trick, while Holley added two of her four goals, and Mackenzie Rosenberg had a pair. After the break, KP changed things up defensively to face-guard Caster with Mackenzie Nickerson and Francesca Tonelli and it limited the UMass-Lowell commit’s touches. The switch worked and the Warriors allowed only one North goal in the first 22 minutes of the second half and took control of the game. The KP offense also kicked into gear. Katie Crowther scored her fourth goal of the game to open the second half and Katherine Yetman scored a pair to put the Warriors back in front at 9-8. After Holley tied the game with 15:18 to play, Lacroix snagged a ground ball on the draw and went straight down the middle to regain the lead. Crowther showed off an array of moves to build the KP lead to three. She ducked out from behind the cage to score and then six minutes later she went side-arm to beat Ebert and force North into a timeout. In the timeout, Vitelli told his team not to panic with more than three minutes remaining. The Rocketeers won the draw control and the ball fell to Caster who sped up the middle to score, taking just 15 seconds off the clock. KP had chances to put the game away denied by Ebert and the North defense, which forced a turnover and came back up the field in the final minute. Caster fed Rosenberg for her third goal of the game with 47 seconds left. After KP went down a player, North again came forward and Holley found space in the middle for a side-arm shot past Watson to tie the game. “To come back from 12-9, we really learned a lot about our kids today; we’ve got kids with rug burns, rolled ankles,” said Vitelli. In the end, the Warriors were able to hold their nerve and pulled out the victory, which sets up an interesting rematch in the final week of the season at North Attleboro. Despite the defeat and the controversial ending, Vitelli was happy to have come back and praised his former star player for keeping the program’s standards high. Julie Boudreau (née Pasquantonio) and her sisters Kelly and Mary played for Vitelli during KP’s dominant period of five straight league championships and a 2006 South sectional title. King Philip (3-3) will try to keep the momentum going on Monday against Foxboro. North Attleboro (4-2) will travel to Canton on Wednesday.